What happened that night, your final night? Double, treble exposure over everything. Burning your letter to me in the ashtray with that strange smile. What did you say over the smoking shards of that letter? That let me release you and leave you to blow its ashes off your plan. Off the ashtray against which you would leave me to read the doctor’s phone number. Sleepless, hopeless, all its dreams exhausted. Is as unknown as if it never happened. As if it was not happening. Remembering everything. It recovered in my hand. Ted Hughes (17 August 1930 – 28 October 1998) was an English poet and children's writer. Critics routinely rank him as one of the best poets of his generation. Hughes was British Poet Laureate from 1984 until his death. 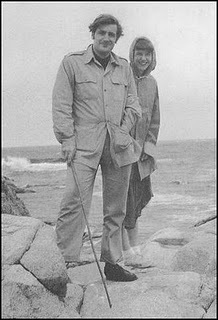 He was married to American poet Sylvia Plath from 1956 until her death by suicide in 1963 at the age of 30. His part in the relationship became controversial to some feminists and (particularly) American admirers of Plath. His last poetic work, Birthday Letters (1998), explored their complex relationship. These poems make reference to Plath's suicide, but none of them addresses directly the circumstances of her death. A poem discovered in October 2010, Last letter, describes what happened during the three days leading up to Plath's suicide.